January is the perfect time to revisit what’s hot—and what’s not—in knowledge management. New tools and techniques crop up all the time, but trends can quickly fizzle out if they don’t deliver the results their proponents promise. So, what’s trending right now, and what does it tell us about the state of KM? Over the past month, APQC surveyed 400 knowledge management professionals about their priorities for the coming year and the changes they see ahead. Reviewing the data affirms a lot of what I already knew or suspected, but it also offers up a few surprises. 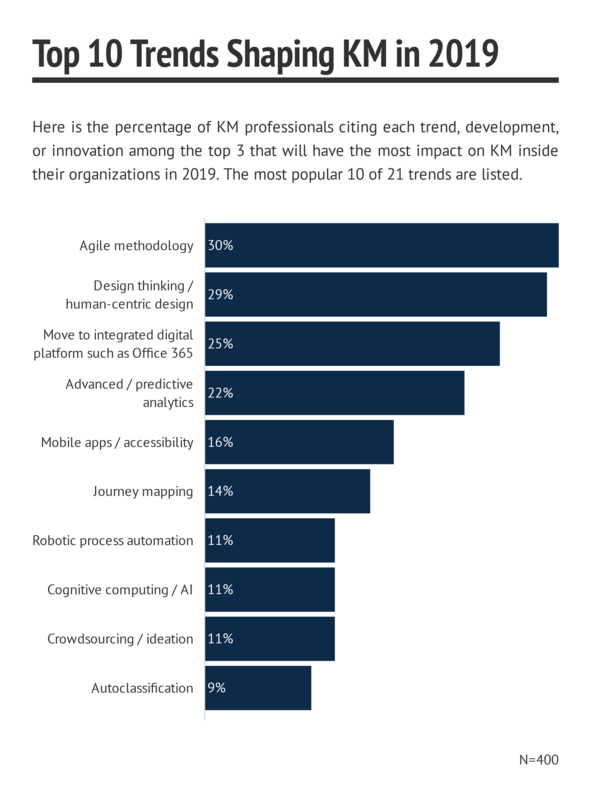 Among the biggest bombshells are the trends, innovations, and developments that people expect to have the most influence on KM in their organizations in the coming year. I’ve chosen to feature this data as APQC’s KM metric of the month to hopefully spark conversation about the drivers of KM change and what the future holds. Unless you’ve been living under a rock, you know that automation and AI are the KM buzzwords of the hour. Vendors and experts alike tout the benefits of automating routine knowledge tasks and using powerful algorithms to recommend relevant content and colleagues based on users' personas and the context of their work. And at APQC, we are seeing early adopters get great results from auto-translation, autoclassification, AI-driven recommendation systems, cognitive search, chatbots, and other cutting-edge technology applications. But if you look at the data, only 11 percent of survey respondents say that robotic process automation, cognitive computing, or AI will have a serious impact on their KM efforts this year. The numbers for many related trends are even smaller. For example, 9 percent of respondents are focused on cognitive search and autoclassification, 8 percent on personalized recommendations, 7 percent on natural language processing, and 6 percent on chatbots. The most prevalent drivers of change this year are not technologies at all, but rather techniques for designing and managing KM systems and approaches. Agile—a project management approach that stresses iteration, collaboration, and customer centricity—tops the list of innovations affecting KM approaches, with 30 percent of respondents listing it among their 2019 guiding forces. A close second is design thinking, a human-centric approach to problem solving that enables organizations to understand user needs, brainstorm ways to meet those needs, and then rapidly test ideas in order to progress toward an effective solution. I knew that Agile and design thinking were gaining popularity in KM, but the sheer number of organizations diving into these methodologies in 2019 floored me. It’s clear that, while new technologies are a huge impetus for KM change, there’s even more energy around tools to help KM programs cope with rapid-fire tech innovation and shifting organizational needs. Here are my thoughts on why agile, responsive design and project management approaches are so popular this year. 1. The pace of change requires adaptive approaches to design and refine KM solutions. We’ve been saying this for at least five years, but business changes seem faster-moving than ever before. There’s a lot of instability out there, and many KM leaders I talk to are reeling from a constant churn of mergers, acquisitions, reorgs, market shifts, and strategic realignments. They know they need to set long-term objectives when it comes to improving the flow of enterprise knowledge, but the goalposts set by executive sponsors are in flux, and they’re worried about change fatigue among both KM staff and end-users. In addition, the tight job market and war for talent are heightening risks related to critical knowledge loss while shortening the lead time KM programs get to address those risks. For these organizations, Agile development and human-centric design represent a different way to think about KM projects. Both methodologies focus on quickly responding to emerging needs, developing a minimum viable product that can be tested, gathering user feedback, iterating, and improving over time. The methodologies also emphasize close collaboration with the customer, so the KM team is designing tools and approaches with rather than for its target users. This can shorten the time needed to deploy solutions (however imperfect) to emerging knowledge needs while increasing the chances that what the KM team comes up with will fit the requirements and workflow of the employees who will use it. 2. Cloud platforms force organizations to do KM a little differently. In addition to breakneck business changes, today’s KM teams are grappling with digital transformation and accelerated development cycles. With on-premise software, KM teams can implement updates and improvements on their own timeline, with lots of preemptive planning. But as more organizations shift to the cloud (and according to the data, another 25 percent are moving to an integrated digital platform like Office 365 this year), some of those decisions are taken out of their hands. KM leaders can come in on Monday morning to major modifications in the portfolio of apps their organizations use to facilitate collaboration and knowledge sharing. And as a result, well-laid plans for management and adoption can quickly devolve into chaos. A nimbler approach to solution design and project management may help these teams roll with the punches, responding promptly to whatever changes vendors throw their way. What do you think? 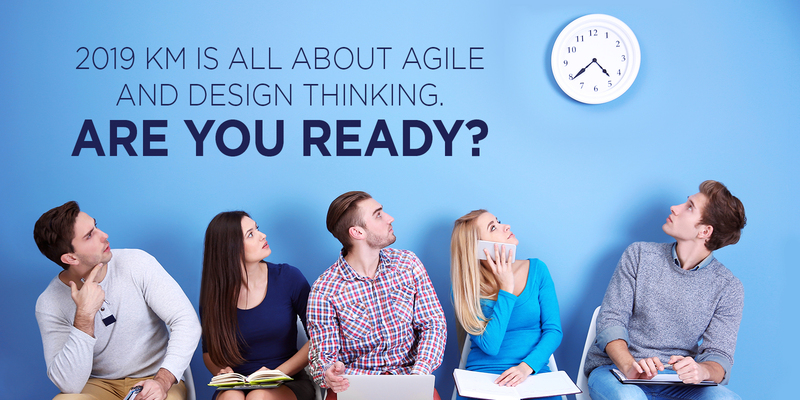 Is your organization adopting Agile or design thinking this year—and if so, why? I’d love to hear your thoughts and experiences. I also encourage APQC members and 2019 KM Priorities survey respondents to register for our exclusive KM in 2019: The Direction of the Discipline webinar on January 30, where we’ll be talking more about the survey data and its implications. You can find additional information on Agile, design thinking, and their application to KM in the following APQC resources. The starred items are publicly available. Hi Lauren! Thanks for your piece on the future of KM. May you recommend some experts/leaders in AI and/or automation? Great question Bebeka. In terms of the role of AI in KM and how the two "play together," I think Seth Earley has some interesting insights. I also follow the big consulting firms (Accenture, Deloitte, EY, Microsoft Services, etc.) since I know they are experimenting internally to determine what will and won't work with clients. I know there are many others out there as well, so if anyone has recommendations, please post them.